Halloween is one of the most fun holidays for several reasons. One, it’s a time to indulge in candy and other baked goodies. Two, nearly everyone loves participating in the holiday spirit of dressing up in costumes — including cute kids and pets. And lastly, it’s a time to get in a creative decorative mood and get crafty with the interior and exterior of your home. 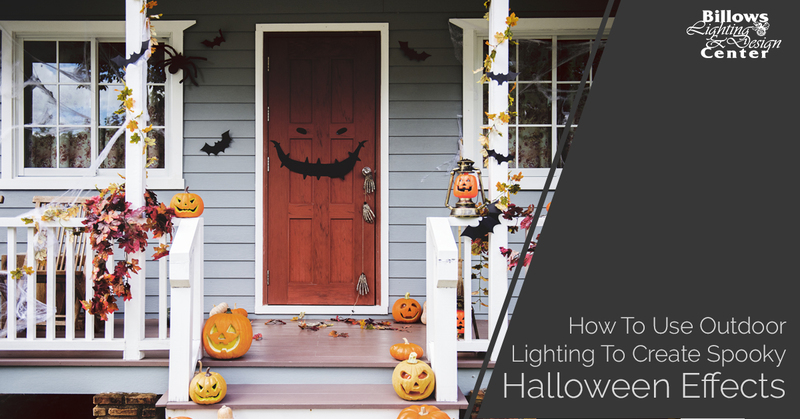 In today’s blog post, we’ll go over how to use your home’s outdoor lighting to create spooky Halloween effects that all your neighborhood kids (and some adults) will love. If you’re looking for outdoor lighting in Berlin that will last you for more than just the Halloween holiday, shop our large selection at Billows Lighting & Design. We can connect you with a lighting consultant that can help you achieve your dream lighting goals. Schedule a consultation today. Continue reading below for our tips on using outdoor lighting to create Halloween effects that will make your home the coolest and spookiest one on the block. We encourage homeowners to get as creative as they want with their outdoor lighting for Halloween! You can either opt for string lights with tiny pumpkins on them, or you can swap out the light bulbs in your outdoor light fixtures with colored ones. If you opt to switch out any bulbs, keep in mind the colors that give the best effects. Black and blue lights are a classic for Halloween and create a spooky element to the exterior of your home. For more fun, family-friendly lighting, orange lights are an ideal swap. If you want to get extra spooky, you can set timers to all your Halloween outdoor lights and have them turn on at different times. You can also sync up a strobe light or fog machine with your outdoor lighting to really tie your lighting and decorations together and create a scary shadowing effect. The finishing touch to match your spooky Halloween lighting isn’t actually related to illumination at all! We recommend setting up a sound system to the outside of your home so that you can either play holiday-themed music (cue “Monster Mash”) or unnerving sound effects with your Halloween-themed outdoor lighting. You can find gizmos, gadgets and other Halloween decorations all around Berlin, but where can you find high-quality outdoor lighting that will last you for the long run? We have the answer for you, and it’s at our Berlin lighting showroom. At Billows Lighting & Design, we offer an array of outdoor lights, ranging from wall sconces to landscape lighting. After your Halloween decorations are put up and then taken down again, you want to have outdoor lighting that will always make your home stand out year-round — no matter what. To view our selection of outdoor light fixtures in person, visit our lighting store today. If you have any additional questions for our team of lighting experts, contact us by calling (856) 281-1399 or by filling out our online form.